I guess when we have Burberry in the shop we should always start with Burberry! This week's Burberry is a cropped, red, toggle coat that is so cute that I just can't even, friends! This one must be tried on, as someone pointed out that it sits *above* the hips, so one only needs to be a size 4 across the top. All the details are there: signature Burberry plaid piping on the inside, and even Burberry toggles! So cute! I feel like this Anthropologie skirt is part Judy Jetson, part gladiator! What's so great about the Cambridge Satchel? The Cambridge Satchel Company was founded in, ahem, Cambridge less than 10 years ago, and originally started with hand-made satchels made at home by two moms. For the longest time you could only get two things from the Cambridge Satchel Company: A 15" leather satchel or an 11" leather satchel. Along with the simplicity of choice, the simplicity of the design is what shines here. You've got your main compartment, you've got your front pocket, and you've got a cute vintage card pocket. Two buckles. And you could only get them in the UK (or on-line direct from their site) Now the Cambridge Satchel Company is huge (good for them! ), they've made many partnerships and have branched out in designs and choices. 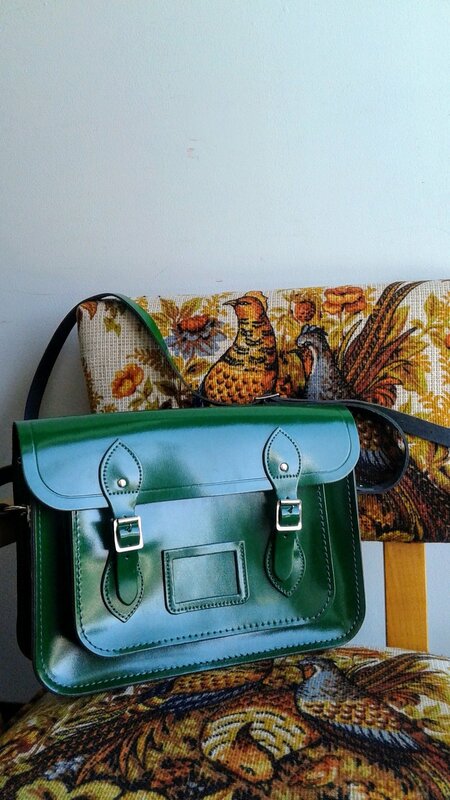 The one we have in the shop for you is a 15" classic satchel in kelly green. Meanwhile, back in Canada....this spacey jacket from our own Kit & Ace! This one is down filled across the front quilted portion and into the cowl. And the cowl is the most curious thing about this jacket, because it looks like a hood, it's attached to the front, but it is NOT attached in the back. So it makes this shawl-like piece in the back that I'm going to go ahead and call....a cape! I can feel the Oak+Fort vibes radiatiing from this Noul cocoon dress (with pockets!)! OK, this is one of the coolest things ever: a Club Monaco vest made entirely of black feathers!! The feathers are marabou feathers (a marabou is a stork-like, scavenger bird from Africa). 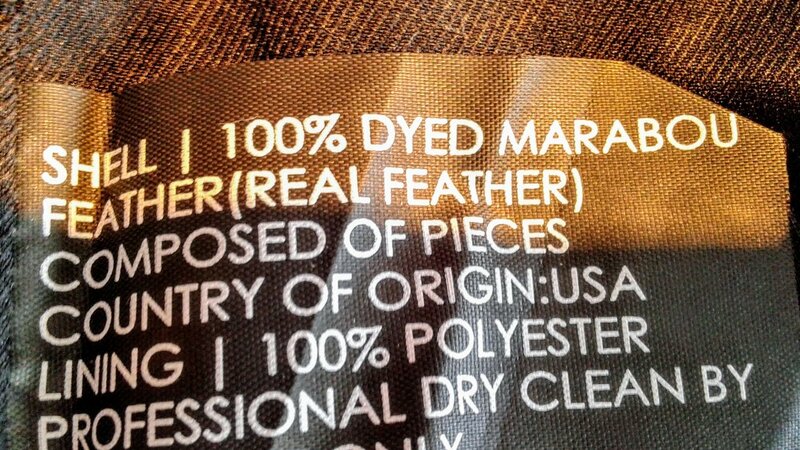 I love the clarification on the tag: REAL FEATHER! Friends, it's tough times in my purse collection these days, as I am not only on a satchel diet, but Matt and Nat and I have broken up. Idon'twanttotalkaboutit, ok?! So this cross body, which looks to me like a relative of the Keely or the Rubicon, from the vintage with the exposed zippers as trim, is all yours! 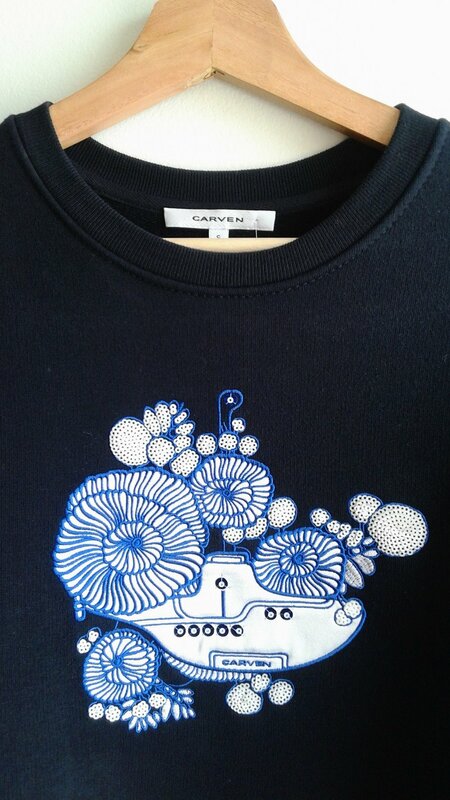 ...it's Carven! From your tiny, French grandmother's colouful scarves and fur coats, to this cropped sweatshirt with a playful submarine on it! Although we are all used to seeing lovely Kate Spade purses in red, get ready for fuschia! Check out the velvet trim and velvet bows in the back! And just in time for sweater-dress season, two Aritzia sweater dresses (with pockets!)! We're doing 12-5 on Saturday this weekend friends, and I will be in on Sunday if you want to come by and get all the juicy details about my break-up with Matt and Nat!